The HTC U Play is a solid Android smartphone. It has enough grunt under the hood, a decent display, strong cameras and smart bundled earbuds – but it’s a package which feels like it’s missing something. Update: This review has been updated to include the addition of the Sense Companion - read on to see how we found it. The HTC U Play is, the Taiwanese firm claims, “for the playful U”. It’s an attempt to give the phone an identity, but it hasn’t really worked. The U Play is a good phone – there’s a pleasing display, premium design and decent cameras – but it’s suffering an identity crisis. It sits below the flagship HTC 10 and its bigger brother, the HTC U Ultra, and neither of the new U handsets will supersede the firm’s next flagship phone, the HTC 11 (although it won’t be called that), which is due to launch in the next month or so. There’s a solid spec sheet, yet the price doesn’t help differentiate it from the swelling ranks of mid-to-high-tier handsets, and it means the HTC U Play risks slipping quietly into the background. There’s style and there's substance – it just feels like we’re missing that je ne sais quoi. The HTC U Play release date is slated for March 1 in the UK and March 8 in Australia, but interestingly HTC has no plans to bring the handset to the US. 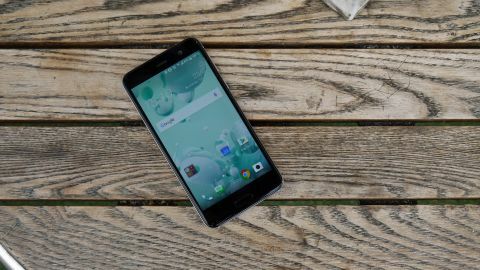 It is, however, introducing the U Ultra stateside – a phone which has more going for it, and which benefits for a couple of defining features the U Play lacks. The HTC U Play price is £399 (around AU$650) SIM-free in the UK, while pricing for Australia has yet to be confirmed. Since release the price of the device has dropped significantly, to around £250 in most cases, a definite bargain. That puts the U Play in the same league as the OnePlus 3T, Moto Z Play, Sony Xperia X Compact and Honor 8 in terms of costs – which is some stiff competition for it to contend with. The focus here is firmly about personalisation. The U Play is a phone which HTC says will listen to you, learn from you and “capture the best of you“. HTC, like seemingly every other company in 2017, has opted to include a ‘smart assistant’ with its device - the “Sense Companion”. This promises to learn from your daily inputs and the information you provide to give useful suggestions at key moments, at least in theory. Unlike Cortana, Alexa and the like however, this assistant doesn’t bark orders, instead it is more about the gentle notifications. These appear as blue bars in the notification shade, or as Facebook Messenger style ‘chat-heads’, both of which are readily dismissable. The reminders generated tend to be generic. If it’s due to rain, it’ll remind you to take an umbrella. Used a lot of battery during your workday? The Sense Companion will remind you to charge the U Play before heading out for the evening. Did you enter your height and weight? It will track your steps and measure your continuing fitness. Whether any of this is useful will depend enormously on how you use your phone, and how much information you want to surrender. A potentially useful feature however is the integration with Boost+, the HTC battery and RAM manager built in. The Sense Companion will regularly monitor your usage, and see if any particular rogue apps are using up a little too much juice in the background before shutting them down if things degenerate further. That is, if the Companion works in this way at all - during the review period these notifications were only sporadic at best. As you use the device, and as the Companion collects more information, this may of course change, machine-learning being contingent on having access to mountains of information. However, with the likes of Google Assistant and Alexa providing a similar service, but better, it begs the question of why the Sense Companion exists at all. Regardless, it is a bit of flavour for the phone, and will likely be enjoyed by those who choose to use it, it is certainly less obtrusive than other, similar programs. The HTC U Play does come with HTC USonic, a clever analyzer that uses the bundled HTC USonic earbuds to engineer the audio output specifically to your ears using a sonic pulse. Plug the USonic earbuds in and you’ll notice one of the shortcomings of the HTC U Play… no headphone jack. Instead they plug into the USB-C port on the base of the phone, which is okay until you hit the problem of wanting to charge the handset while continuing to use the headphones. You simply can’t. You either have to switch to a Bluetooth set (but who wants to carry around two sets of headphones?) or stop listening to music. You can, of course, opt to use the internal speaker – but that’s not really feasible when you’re in the office or on public transport. The first time you plug the earbuds in the U Play will recognize that they're USonic buds and launch the setup wizard so you can analyze your ears. It’s a simple, quick process that just takes a few seconds. When the results are in you can toggle the effect on and off so that you can hear the difference – although while there is a difference it doesn’t feel especially dramatic. Audio playback is enhanced, but it’s not clear whether that’s because the phone really has accurately mapped the inside of our ears, or whether it’s just using the BoomSound-style enhancements we’ve enjoyed on previous HTC phones. A notification appears at the top of the screen when USonic is enabled, and you can tap this notification in the pull-down panel to “readjust to your environment”. So if, for example, you move from a noisy place to a quieter location (or vice versa) give this a quick tap and USonic will tweak the playback levels to give you optimum quality by detecting the sound environment around you. The HTC U Play sports a classic smartphone look, with a glass front, metal frame and a slightly more unique pearlescent ‘Liquid Surface’ glass rear. Front-on, the U Play looks similar to the latest iPhone and Galaxy handsets – although that’s no bad thing, and unlike Samsung, HTC has removed its branding from the display side for a cleaner, minimalist finish. The textured power/lock key and volume rocker are easy to locate on the right side of the phone, while your 2-in-1 nanoSIM and microSD tray resides on the top of the U Play. The 5.2-inch display means dimensions are kept to a relatively compact 146 x 72.9 x 8mm, making the HTC U Play easy to hold and operate one-handed. At 145g it’s also surprisingly lightweight, which is nice during extendingBut n gaming sessions or movie playback. However it also means the U Play feels a little cheaper than it is, while the Liquid Surface rear proves to be rather divisive. It’s available in four base colors: white, blue, pink and black, but twist the phone in the light and you’ll be treated to a variety of hues. We had the white HTC U Play for review, and grew fond of the way it played with the light, but others we showed it to were less impressed with the finish. What everyone can agree on though is a lack of grip. While we were able to firmly grasp the U Play with one hand, the brushed metal sides and smooth glass rear meant there was little for the palm to play with; if you’re accident-prone you’ll want to stick a cover on your U Play before venturing outdoors. Back to the front and you’ll find a fingerprint scanner that doubles as the home button below the screen. Digit recognition is fast and accurate, and it’s flanked by touch-sensitive multi-tasking and back keys, which remain hidden until you wake the screen and their backlights trigger. Turning our attention to the screen, the 5.2-inch Super LCD panel boasts a full HD (1080 x 1920) resolution, providing bright, colorful and detailed imagery. There’s not a lot more to say on this subject – it’s a spec we’ve come to expect at this price point, and the U Play’s screen doesn’t disappoint.